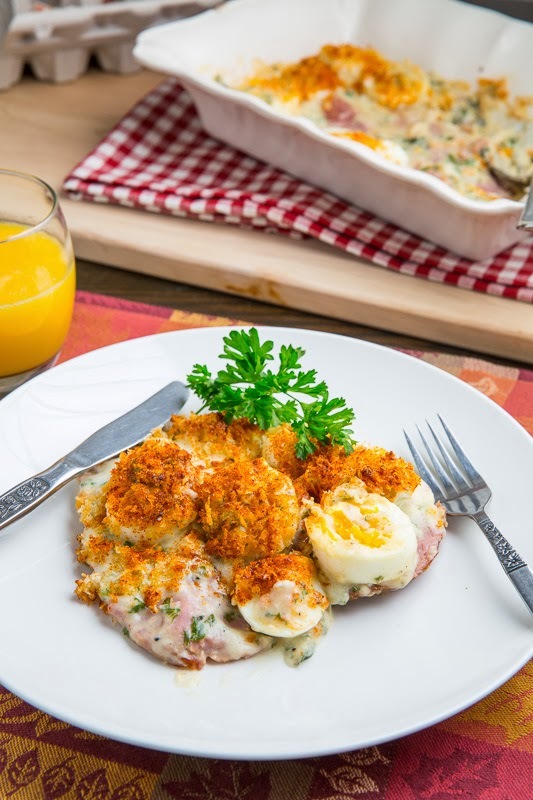 Ham and eggs baked in a creamy cheese sauce with a crunchy breadcrumb topping that is a great way to start the day! Are you looking for a special breakfast for the holidays? This is it! Until recently I had actually never heard of a ham and egg au gratin but when I saw it on pinterest recently, via Scrumptious South Africa, I knew that I would have to make it! 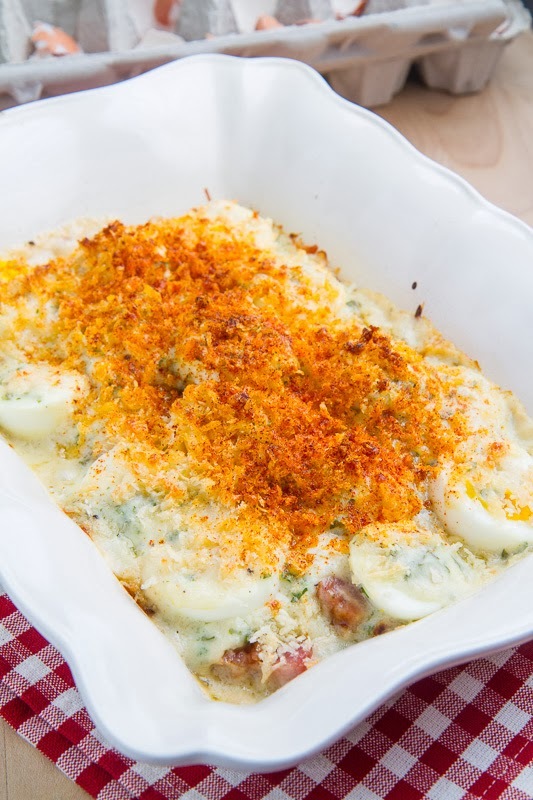 The ham and egg au gratin is essentially slices of ham and hard boiled eggs that are made ‘gratin’ style, covered in a creamy sauce and baked until golden brown and bubbling! Besides the fabulous ham and egg combo what really makes this recipe work is the super tasty sauce, which is pretty much a basic bechamel sauce that is seasoned with dijon mustard, lemon juice and parsley and I could not help but throw in plenty of cheese! In addition to being one of the tastiest breakfasts that I’ve had in a long time the recipe is actually really easy! You pretty much just need to make the hard boiled eggs, make the sauce and then assemble and bake it. With the ham and egg combo I immediately thought of this as a breakfast dish and it is perfect for days when you have a bit of time in the morning like the weekend or a holiday but if you assemble everything the night before you can easily bake it on a busy weekday morning! If you have oven safe plates make individual servings! Cover the eggs in water, bring to a boil, turn off the heat, cover and let sit for 7 minutes before transferring to cold water, peeling and slicing when cool enough to handle. Meanwhile, melt the butter in a small sauce pan over medium heat and let it froth until it just starts to turn a light golden brown. Sprinkle in the flour and let cook while whisking until it just starts to turn a light golden brown, about 2-3 minutes. Add the milk and simmer while whisking until it thickens, about 2-3 minutes. Mix in the parmesan, mustard, lemon juice and parsley, season with salt, pepper and cayenne to taste and remove from heat. Place the ham in a greased baking dish, top with the sliced eggs followed by the sauce, the mixture of the breadcrumbs, parmesan and butter and optionally sprinkle on some paprika or cayenne. Bake in a preheated 400F/200C oven until the topping is a light golden brown and the sides are bubbling, about 8-12 minutes. Option: Make and assemble everything except the breadcrumb topping the night before and then just sprinkle on the breadcrumb topping and bake in the morning. Oh wow Kevin! this looks like a tasty and hearty breakfast perfect for a Holiday morning! This is my ultimate breakfast comfort food! And, so perfect for holiday breakfast. Love these eggs ~ good 'n hearty! 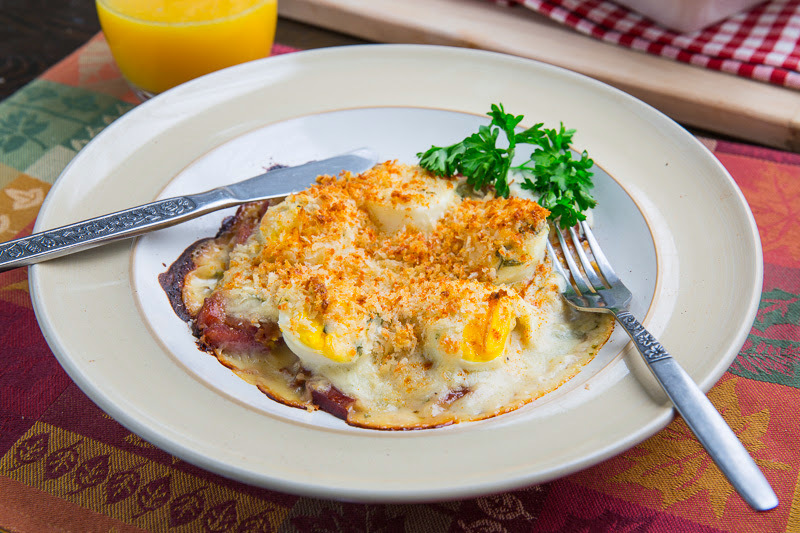 OMG I've never heard of a breakfast gratin, but YES PLEASE!!! Marianne: I am glad that you and your family enjoyed it! Oh Kevin I love the idea of a breakfast gratin! Sharing this one in my next friday links!!! I will be making this christmas eve to eat on christmas morning. thank you!!! This was very rich and tasty. Serve with thick-cut bread! I didn't use any salt because the ham was salty enough by itself. When I was baking it, it wouldn't bubble. I even cooked it 20 minutes over time but it still wouldn't bubble, so I took it out and it was fine anyway. So for other people: if it doesn't bubble, it's okay. This looks really good, Kevin! Thanks for sharing with us.